This is the third in a set of three books that are expanded treatments of a series of articles that appeared in Collier’s magazine beginning in 1952 (for more background information see the review of the first book, Across the Space Frontier). The first half of this book covers the history of what had been learned about Mars up to the time of publication — before any spacecraft had been launched into Earth orbit, let alone to Mars. At the time it was thought that the Martian atmosphere was 10 times more dense than it is now known to be. Therefore, a winged craft such as seen on the jacket cover was assumed for landing on Mars. Von Braun had written an earlier book, The Mars Project , first published in 1953, in which he described the technical details for a 10-ship expedition to Mars with 70 people (“men”). The ships would be assembled in orbit at the space station, requiring 950 ferry flights of his 3-stage fully re-usable rocket design. 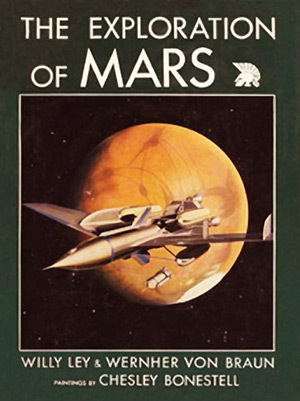 Von Braun also wrote a fictional account of such a trip which was originally published only in German but has been republished in English in 2006 as Project Mars . In it the crew encounters an intelligent civilization on Mars — an outcome that von Braun intended as fanciful and not predictive, but one that could not be ruled out with the knowledge of the time, when color changes on Mars were thought to possibly be large-scale changes in vegetation (we now know them to be from dust storms). When The Exploration of Mars was written three years later, the plan had been revised to use 2 ships and a crew of 12 “men” (again no mention of the possibility of any women). This reduced the needed propellant to only 10 percent of that needed for the 1953 plan, but it still required 400 supply launches. The 3-stage launchers were also re-designed so that only the manned third stage was re-usable, with the first two stages being expendable due to high recovery and refurbishment costs (a situation that still plagues us today). The 2-hour orbit of the space station allowed one launch window per day. Von Braun envisioned two launches a few minutes apart each day for seven months. He calculated that the total amount of propellant used was equivalent to the entire Berlin Airlift, so there was some precedent for such an undertaking. Of the two ships that transit to Mars, one would be a passenger ship with return fuel which would orbit Mars but not land. The second ship would be a cargo ship which included a lander. The fuel would be hydrazine and nitric acid. There would be 449 days between entering Mars orbit and departing Mars orbit for the return to Earth. A crew of nine would descend to the Martian surface for a stay of about 400 days. The first task once Mars orbit was achieved would be to survey the surface and choose a landing site and test the atmosphere for density and composition with sounding rockets (no provision was made for prior robotic spacecraft to perform these functions). Two tractors in the landing craft would allow exploration about 100 miles from the landing site. Somewhat disappointingly, the 400-day stay on the surface was covered in the book by only three paragraphs. Even with better technology today, we still have a very long way to go before we catch up with von Braun’s expansive vision.